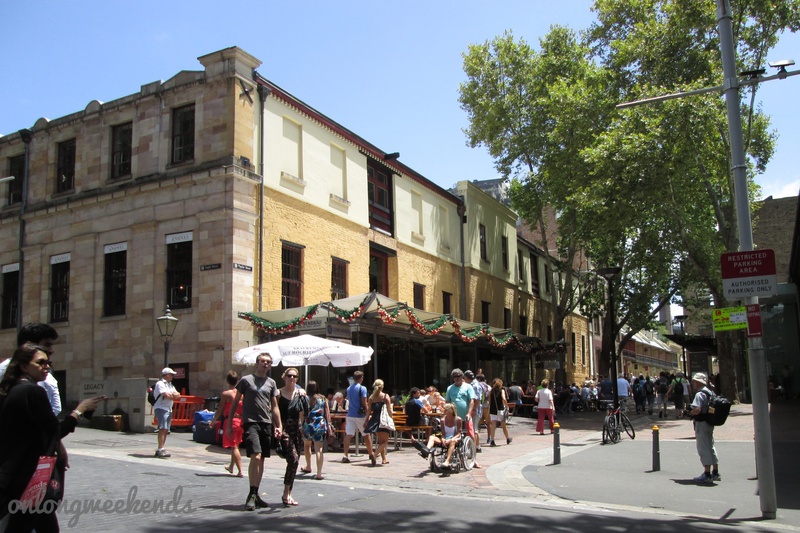 The Rocks is one of the historic places in Sydney. One of the sites where the first settlers lived. One of areas I haven’t been to and was dying to see after I read its history. One fine day, I ventured on my own to the city for a walk through the cobbled and touristy steps of this side of Sydney near Circular Quay. Alighting from the train station, I was so excited to find my way to Gloucester Street. 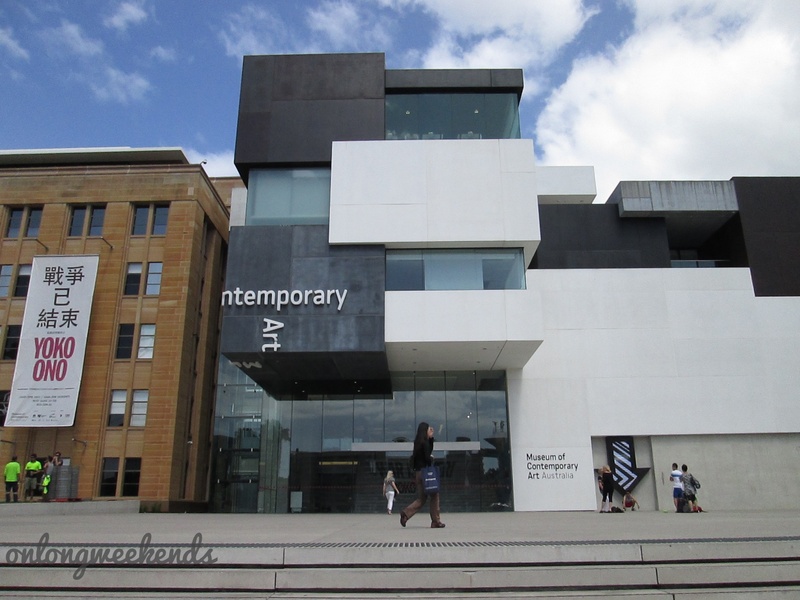 Amidst the sea of people lining up at the wharf, I was so giddy walking towards the Museum of Contemporary Art and beyond. 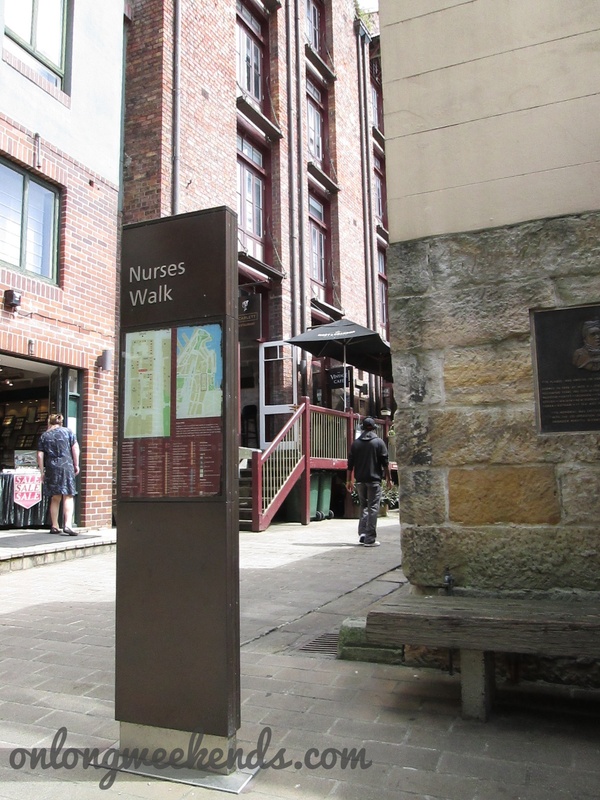 Nurses Walk was the first area I stumbled upon and I got lost with the nooks and crannies of what I refer to as a walk through time. It was getting lost in a good sense because I could go around and around the area looking at old structures (turn of the century houses and pubs), climbing stairs and getting into an archeological find without thinking that my companion might not be enjoying this DIY walking tour. Nurses Walk houses small cafes and stores. It pays homage to the nurses that served the country and the world during the war. A small bench and a commemorative plate describe the area. 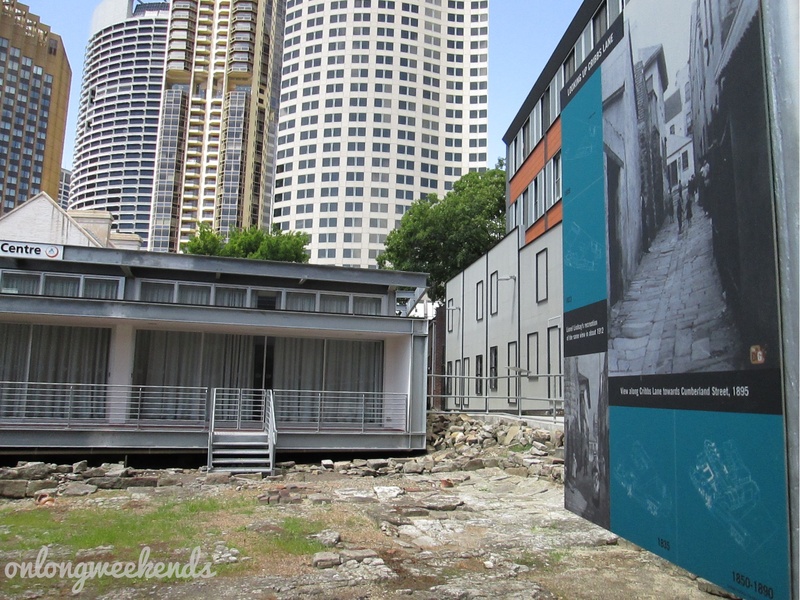 As I was finding my way towards Susannah Place, I took a peek of what looked like an excavation at Cumberland. At the ground floor of YHA hotel is the Big Dig, a discovery of authentic remnants of late 18 century houses of local laborers with some of household tools on display. It was good know that they preserved the site and built the hotel on top of it. Think of an old bahay na bato with open space at the ground floor. I can’t describe how excited I was upon seeing the place. I felt like I discovered it by myself. Maybe because I used to dream of becoming an archeologist when I was in grade school. A few more walks and climbs, I finally saw what I was searching for – row of houses that witnessed the development of the city for centuries. 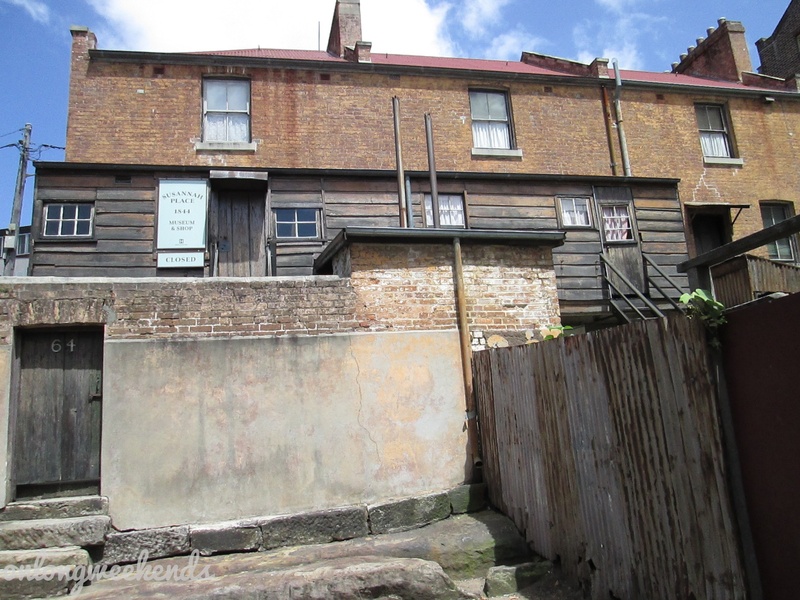 Susannah Place is just one of those actual houses preserved to tell the stories of the working class years ago. It is some sort of a living museum since some of which are still resided by locals until now. The museum was closed that hour but it didn’t stop me from walking up and down the small street. After I satiated myself of the old world, I turned by attention to the open spaces and engineering grandeur. I walked through the Argyle Cut which was an under ground tunnel turned parking lot made possible by carving the large stone that used to face the harbour. I marvelled at the sight in Dawes Point Park where riders and tourists abound for some picturesque views. I contemplated of having lunch out in the sun while people watching. I managed to find myself at the foot of the Harbour Bridge. That’s what you get if you don’t tell manong cleaner that you’re a bit lost. Since it was summer, people were having lunch out in the sun – at the First Fleet Park where a big anchor monument awaits, at the Rocks Market or any open spaces where one can sit and have a quiet lunch with the pigeons. 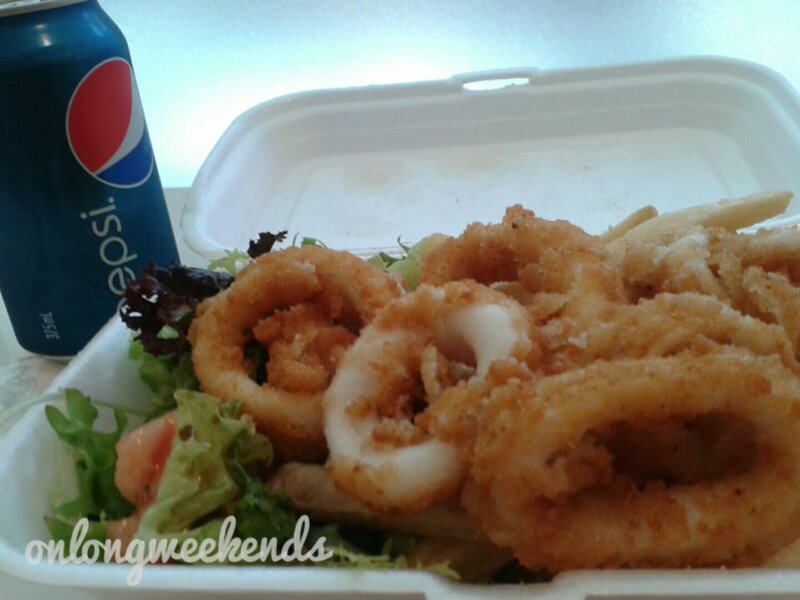 I ended having calamari and chips at a nearby air-conditioned food court after hours of walking and changing from flats to fit-flops. I must say, having a historical tour all by myself is not so bad. I will definitely do this again. On foot: The Rocks is an easy, 15-minute downhill stroll from Town Hall station, 10-minutes from Wynyard station and a two-minute walk from Circular Quay. The main entry point to The Rocks is via George Street. If you’re walking from Darling Harbour, you can take Hickson Road via Walsh Bay, or Kent and Argyle streets through Millers Point. By train : Take the train to Circular Quay, head in the direction of Sydney Harbour Bridge, and you’re only a stroll away. If you’re coming from Wynyard station, walk north down George Street towards the harbour and you’ll be here in 10 minutes. By Ferry : Take a ride to Circular Quay and it is s short walk from there. This is where it all started. If Garfield hates his Mondays, he would definitely love waking up to the first work of the week if the scene is like this. Just like me (not that I hate Monday —just the traffic that goes with it). 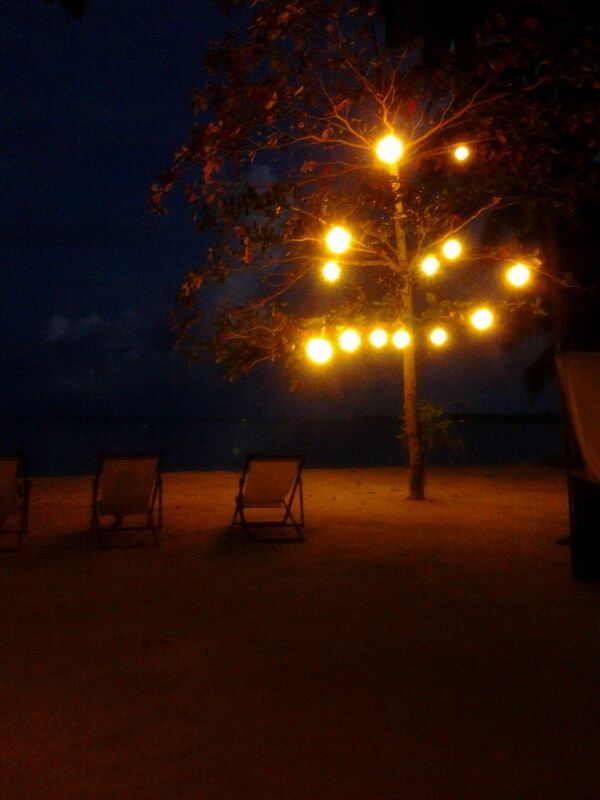 I spent my week in Siargao (for the nth time) for the project we have there. Since we have a full packed sched on Monday, my colleagues and I decided to cut our weekend short and proceeded to Siargao on Sunday (waking up at 3 AM for a 5.30AM flight is such a breeze, as of late!). My companions were not first timers here in the island but it was the first time we traveled together for the project. For a change, it was a different of vibe. They were outgoing and funny as you can be. It seemed like we’ve been traveling together for so long! Well, if you count the numerous emails and reports that travel back and forth among us —then, that made us close. It was fun talking about non office stuff on a Sunday. You talk about pizza, abs (yes, the six pack type) and tips for all the single ladies. It was a different kind of fun. And how fun it was when we walked from our resort to the fave pizza place (give or take a good 20 minute walk in the unpaved and unlit road of GL) with the moon as our only source of light. Pizza and pasta came and eaten. Playing pool followed. Night cap with the wind blowing on your face. Ahhh, wish the work place is always like this. And then the sandman came along for a restful sleep with sound of the wind singing a lullaby. As my clock hit 5.20 AM, I peeked at my window and this sight welcomed me. Hello, Monday! After two years and many trips in this part of the island (2nd for this year), I still get mesmerized of this mala-Blue Crush view in the morning. 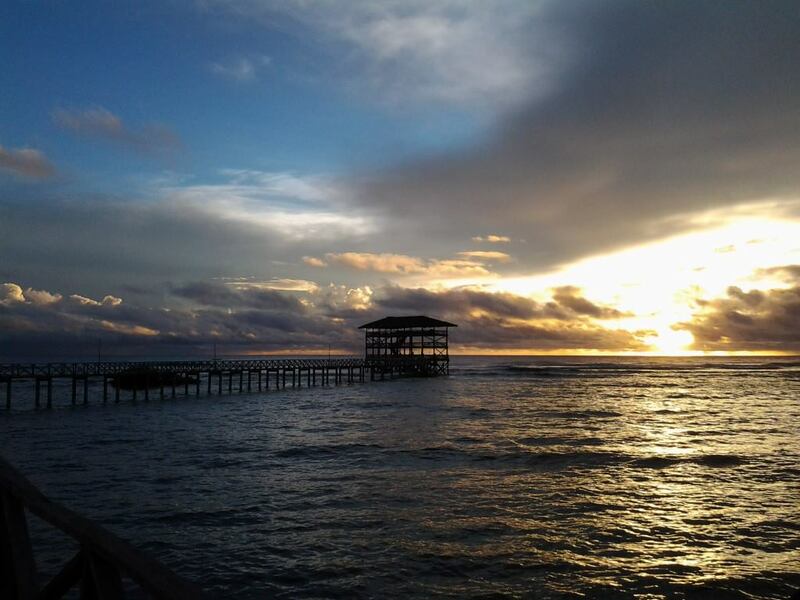 Siargao Island can be reached thru Cebu Pacific via Cebu. 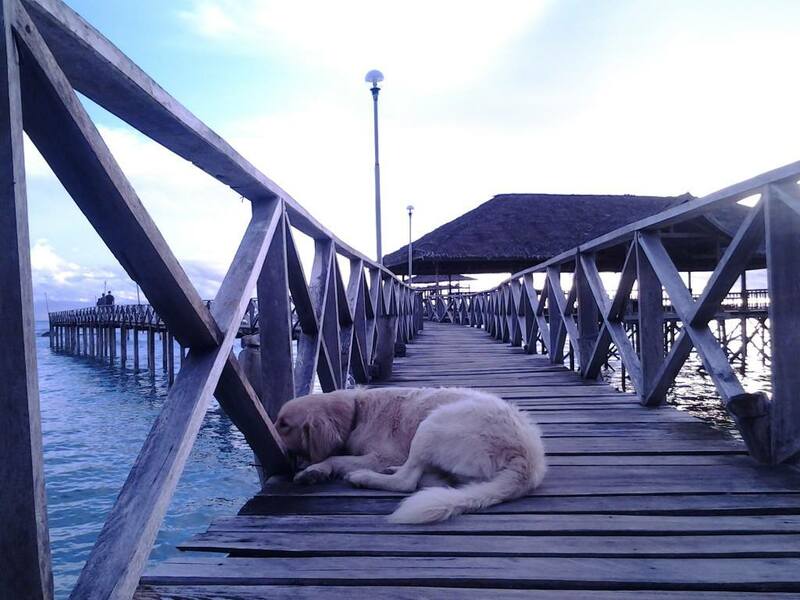 A 2 hour ferry trip can also take you to Siargao if you enter Surigao City via Palexpress and Cebu Pacific. From Sayak Airport in Del Carmen or Dapa Ferry Terminal, hire a habal-habal or multicab going to General Luna(Cloud 9) and other parts of the island.